Was there a background update or something I am unaware of? 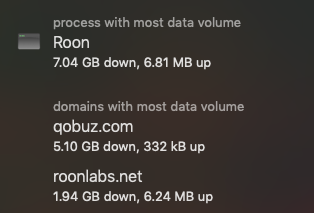 In the screenshot taken from LittleSnitch you can see that RoonLabs has accounted for 1.94GB and Qobuz 5.10GB and ROON total 7.04GB which is the two added together. I suspect it may be caused by the persistent monitoring of the songs you played and tried to recommend to you similar songs to play and the checking of update to the artists information, album information etc. Anyway I do not like Roon at all, it messed up my tag and I cannot find the album or songs in my library as I used to and I need to edit the tags of genre, artists etc. to revert it to the usual. Well, you have the meta data which consists of images, lyrics, artist and album/track data, and the like. I suspect as you browse more (checking genre's and the like) that load is not exactly small. Still, almost 2 Gigs seems a lot. Roon has defended their data/db design choice on their forums when some (like me 😋) have expressed surprise at it's size, structure, and how it seriously slows down local backups. "...The other thing to note is that you have so many files because we save your artist photos and album artwork as individual files. We use a hashed deep directory structure to avoid having directories with many thousands of files, which can cause performance issues....If your backup software is breaking, I suggest you use better software for your backups. If it’s just slow, well, that’s the reality of having all your data local...."
A couple of hours yesterday.